Directions Mix flour, sugar, cocoa, soda and salt. Add the liquid: vanilla, vinegar, and the oil. Pour the cold water over the mixture and stir until moistened. Pour into 8 x 8-inch pan. Bake at 350°F. oven for 25 to 30 minutes, or until it springs back when touched lightly. Notes This cake is 'wacky' because it doesn't use any eggs. Apparently this was a good wartime recipe when eggs and fat was hard to come by. It's surprisingly tasty and a good dessert when you only have the bare essentials in the kitchen. I used a 7" round spring form pan and it was fine. I should have run a knife around the edges before releasing it. Peanut Butter Frosting pairs well with this cake. 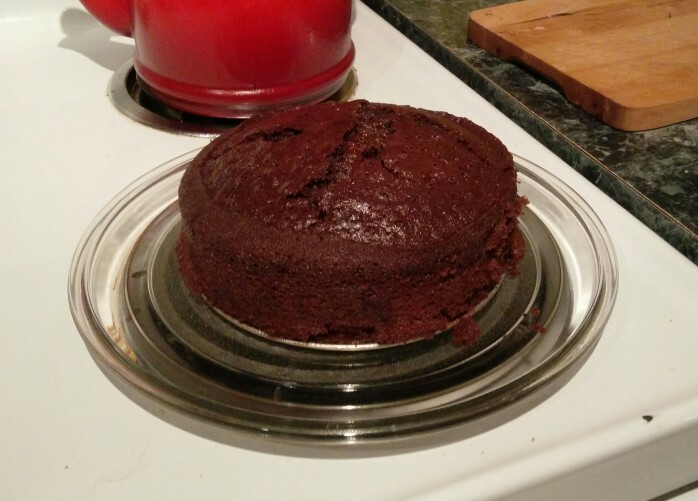 This cake will fail the knife test - I baked it for almost 45 minutes the first try because of that. It turned out fine.